We have had a hugely successful and enjoyable tour to Paris (8th – 12th April). Follow our Twitter feed for the very latest comments. 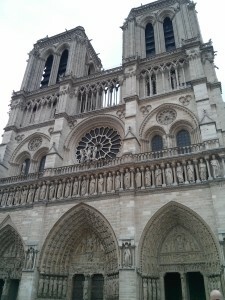 Saturday 11th update… Soon to rehearse in Notre Dame. Wow! What a concert! 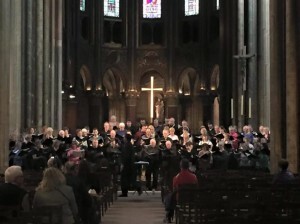 Everyone pulled together to make a glorious sound at St Germain des Pres with organist Paul Carr and conductor Adrian Lucas. Another resonant church, but this time the gothic architecture seems to focus and blend the sound more than at La Madeleine. A successful and well-attended free concert today at the impressive Parthenon-inspired La Madeleine church. An enormously resonant building! Plenty of applause from the appreciative audience. 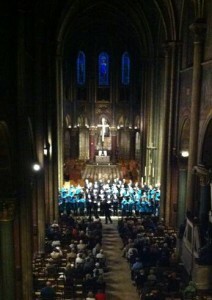 Well, the choir has arrived by Eurostar and settled into our hotel. Having sought a tasty evening meal, and the odd glass or two, we are girding our loins for our first concert tomorrow afternoon at the Madeleine church. Here is a link to more information about the tour. 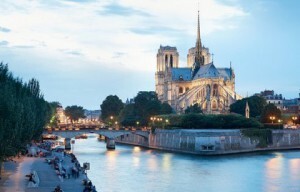 We are very excited by our forthcoming tour to Paris (8th – 12th April). 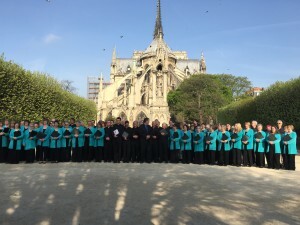 A large party of singers and supporters will set off to enjoy Parisian delights and to make fantastic music in the Madeleine and St Germain des Pres churches and the Cathedrale Notre Dame de Paris.